I spent an entire weekend recently reconnecting with my drum kit, more specifically I was rediscovering my multitrack drum recording workflow. It's been nearly four years since I last mic'd up and recorded a drum kit in my studio. The studio I used to work in wasn't big enough to set up a drum kit in... and it wasn't soundproof at all. In my new studio I now have plenty of room for my kit to be set up in and the soundproofing we installed works a dream so I don't need to worry about upsetting my neighbours. I thought recording drums would be similar to riding a bike... as in we never forget how to ride a bike but how wrong was I? Let's put drum microphone placement techniques and mixing techniques aside for this article, instead, we list 10 mistakes you should avoid when recording multitrack acoustic drums that for many of you may seem obvious but trust me these are easy mistakes to make whether you are new to recording drums or slightly out of practice like me. After you have positioned your close drum microphones across the kit you need to check that all of the boom stands you have set up are not touching any part of the kit such as a cymbal stand or even the ring that surrounds the hole in the kick drum resonant head. Microphone stands that touch parts of the drums will pick up vibrations from the kit that will transmit through the boom to the microphone. Take the time to get the positioning of your stands absolutely isolated otherwise you'll get some unflattering noises in your recorded tracks. You are always going to get some hi-hat bleed down the snare mic, that's to be expected but watch out for air blowing into the snare mic from the hi-hat when the hi-hats closes. This causes a short "rush of air" sound hitting the snare mic, it doesn't sound good. Two simple fixes are to either angle the snare top mic away slightly from the hi-hats or reposition the microphone's height up or down. Setting up drums and throwing an array of microphones across the kit is lots of fun but don't let common sense take a leave of absence in all the fun you are having. Make sure you use cables that have plenty of length so that cables are never under tension or laid in ways that are trip hazards. 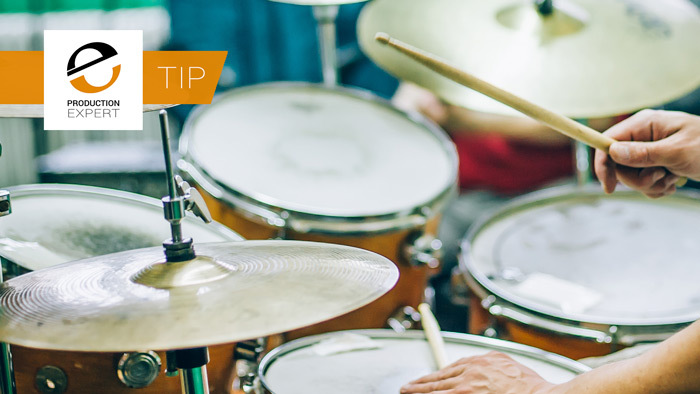 If possible, avoid setting up your drums close to walls because early reflections bouncing off the walls could cause you problems in the mix. It's also good to have space around the kit so that you have ample room for microphone stands along with easy access for the drummer to sit at their throne. Rule of thumb to use here: If a drummer can touch a wall from their throne position you should move the drums further away from that wall. This is easily done, especially if you are auditioning a selection of snare drums. As you can see from the image above there is a snare drum on the floor laying on its side close to the floor tom... looks pretty harmless doesn't it? This mistake cost me over an hour in retuning and mic placement as I heard a pitch that didn't sound quite right through the drum overhead mics. When I noticed the spare snare was causing this issue I removed it from the room and the resonance I heard in my test recordings disappeared. Take extra care with drum overhead microphones as these can easily topple over if not set up with plenty of care. In some cases, you may need to add counterweights to the opposite end of the boom arm to stop the overhead microphones drooping down. There are many purpose-built microphone counterweights available, however, if you have a handful of spare lightweight dumbbell weights lying around, like me... because let's be honest who has time to work out when we can record drums instead... use these if you start to see your overhead microphones droop towards the drummer. Don't be lazy when setting up the drum kit or microphone stands. Take extra care in making sure all nuts, bolts, clips and levers are tightened down firmly. Parts of a drum kit can overtime work themselves loose so make sure you check every fixture before recording your drums otherwise you may get some irritating rattles in your tracks... or in a worse case scenario, you may even have part of the kit collapse like a cymbal stand during a take. Drum mats are essential. You don't need to use a purpose made mat but you need something under your kit, even if it's an old length of carpet. Drum spikes under kick drum legs can cause a huge amount of damage to wood floors within small periods of time so make sure you avoid damaging the room you are in with a protective layer under the drums. Drum kits also have a habit of shifting forward slightly over the course of a session. Use a carpet under the drums to keep the kit in the spot you set them up in. Drum recording can also be a messy job, have you ever look under a drummer's throne after a long session? There is usually a heavy dusting of wood chippings from their sticks. Using a carpet under the drums also helps to contain those wood chips saving you time tidying up when you are breaking down the kit. Never assume that you'll get a great drum sound from microphone placement alone. Like other pitched instruments, including guitars and pianos, drums need tuning in order to sound great at source. Always have a drum key to hand to tune drum heads to avoid flabby sounding shells or to tune out sympathetic resonances from other kit pieces. If you struggle to tune drums then I suggest you get the Tune Bot. This simple little device takes the guesswork out of tuning drums, it's also not too dissimilar to clip on guitar tuners. The last, but no means least important mistake to avoid when recording acoustic drums is setting up microphones in such a way that makes it easy for the drummer to accidentally hit the mics with their sticks in performance. Microphones are fragile devices so you wouldn't want your kit damaged in your tracking workflow. Also, the sound produced by a drummer hitting a microphone is loud click sound, which typically replaces the sound of the kit piece they intended to hit. Always ask your drummer if they are comfortable with the positioning of the microphones. Get them to play around the kit so that you can see if there are any close mics that can be repositioned so that the drummer doesn't need to change their style in order to avoid hitting any of the mics with their sticks.